Vinyl Siding is a veneer layer on the outside of your home, that is made of slats of plastic material made to look like wooden boards. If your home has Vinyl Siding in some areas and Brick Siding or Wood Siding in other areas, then you should put checkmarks as home features in your Home Wizard app for each type of siding that you have. For vinyl siding to protect your home, it must not have any gaps that can allow water to penetrate behind the siding. 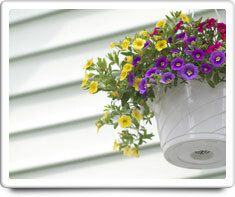 Vinyl siding does not need to be painted, but to retain its appearance, vinyl siding must be cleaned. Brick Siding, Foundation, Pest Control and Wood Siding. Shown in the 'Routine Care' section are the recommended routine maintenance tasks for your vinyl siding. The 'Q & A' section shows answers to common questions. And the 'Articles' section provides helpful articles about your vinyl siding.